Everybody has a favourite bug. Some like shiny, colourful beetles or busy ants or soft pale moths best. Others prefer squishy slugs or fuzzy caterpillars that turn into bright butterflies. 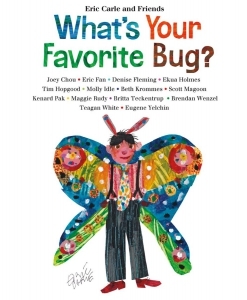 With beautiful illustrations and charming personal stories, fourteen children's book artists share their favourite bugs and why they love them. Artists include Brendan Wenzel, Molly Idle, Eric Fan, Scott Magoon, Eugene Yelchin and more. 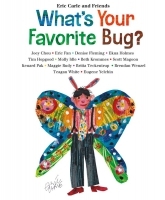 In this companion to What's Your Favorite Animal and What's Your Favorite Color?, Eric Carle and fourteen other beloved children's book artists illustrate their favourite bugs and explain why they love them.